What promised to be a battle between two of the top five teams in Division II girls tennis turned into a route by No. 1 Notre Dame Prep on Monday. With an 8-1 win over No. 4 Cactus Shadows (10-2, 5-2), the Saints (10-0, 5-0) further cemented themselves as the team to beat in Division II girls tennis. What the overall score doesn’t show is how close the individual matches were. The sweltering 93-degree spring afternoon was nothing compared to the intensity on the court. The Saints took the first two doubles matches, with an 8-3 win at No. 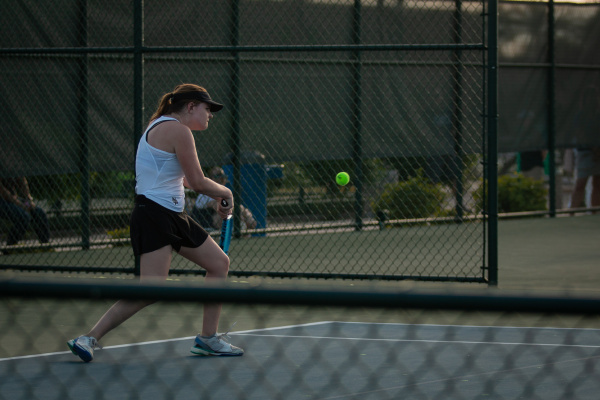 2 from the senior duo Grace Hogan and Natalie Hoffman– a match that they closed out by winning five straight games -- and a close 8-6 win from junior Meg Phillips and freshman Madison Howe at No. 3 doubles. The most intense action came in the No. 1 doubles match. Hard-hitting Notre Dame sophomores Brook Belitz and Maysa Tuftin went back and forth against sisters Danielle and Nicole Quenzler for the Falcons. The Quenzler sisters’ consistency was enough to hold off the onslaught of winners from Belitz and Tuftin, and Cactus Shadows got its lone point of the afternoon with an 8-6 win in this match. Cactus Shadows sisters Nicole (left) and Danielle (right) Quenzler played No. 1 doubles for the Falcons. The duo is 11-1 at No. 1 doubles this season. 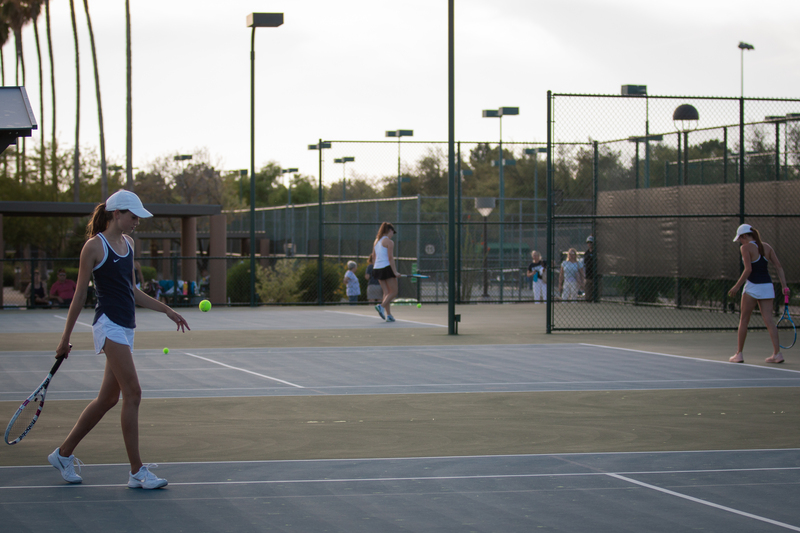 (Photo: Sarah Farrell/AZPreps365)As that match was finishing up, the singles matches were already going out. That’s where the big momentum shift came for the Saints. Hogan was the first singles match to finish with a 6-1, 6-2 win at No. 4, making it her ninth straight singles win this season, and it changed the trajectory of the match in favor of Notre Dame. The pressure seemed non-existent as Phillips won 6-2, 6-0 at No. 5 singles, and after falling in doubles, Belitz powered through her match 6-1, 6-1 at No. 1 singles to clinch for the Saints. With the match in hand, the true character of the Saints squad came out in the waning hours of play. Howe had to come back from losing the first set against Ellie McDonough before winning 4-6, 6-3, 10-3 at No. 6 singles, while Tuftin got a hard-fought 7-6 (7-4), 6-2 win over Nicole Quenzler at No. 2 singles. As the No. 2 singles match was finishing up, there was an absolute grind of a match happening on the court next to them. 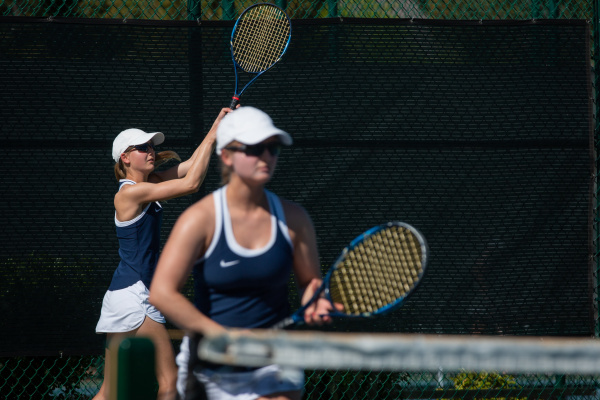 Notre Dame’s Hoffman and the Falcon’s Caroline Nieminen were one of the first singles matches to go on at around 4:30 p.m. Nearly two hours later, they had split tiebreak sets and were still on the court. At that point they were the only match still going, but all of the Saints players were glued to the fence-line watching. Every time Hoffman won a point, they all erupted in cheers. Nearly an hour after the Saints clinched the match, Hoffman was fighting through a tiebreak for the third set. With her back against the wall at 8-9, she rattled off three straight points to win the match, 7-6, 6-7, 11-9. For Dinges, seeing players battle back from being down was the most important takeaway from this match. Cactus Shadows will look to recover from back-to-back losses – the Falcons fell 4-5 to Prescott on April 4 – with a match today at Greenway at 3:30 p.m. The Saints’ final home match is today at 3 p.m. against Mingus Union. 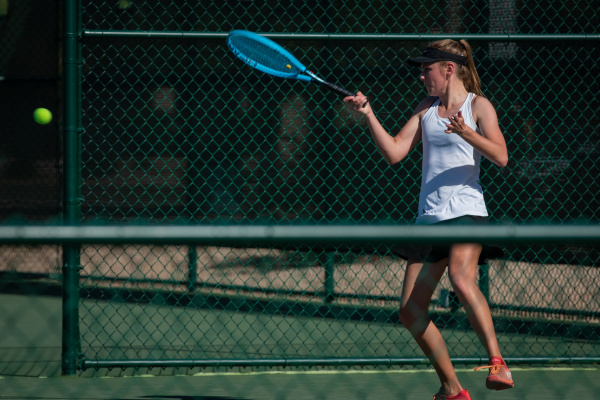 The team finishes the season with three straight road matches against Flagstaff, Coconino and Thunderbird before the first round of state playoffs April 23.